The Grammy award-winning producer uses samples of the sounds made by five international athletes while training for the Olympics as the beat of the song. The track, part of Coca-Cola's global Move To The Beat campaign for the Olympics, comes complete with lyrics from chart star Katy B. The grunts, groans, heartbeats, screams and pounding from training are all used as beats of the song. Ronson, who said it was a "no-brainer" to try to be involved, travelled to the athletes' home grounds to record them. 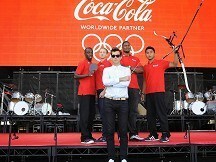 Britain's Darius Knight, a 21-year-old table tennis player, cringed as Ronson told Coca-Cola's global London 2012 marketing launch, that his "very unusual grunt" will now be immortalised in the song. The chart star said: "Darius has this very unusual sound. It is great. Sometimes he uses it to put off his opponents and sometimes it is a sound of victory - to me it sounded like James Brown so I knew I would use that." Ronson said he turned Kseniya Vdovina, a 400m sprinter from Russia, into "the bionic woman" by attaching microphones to her body. The best sounds from Mexican taekwondo star Maria Espinoza were "the screams and the grunts that she made when she was kicking the c*** out of somebody", according to Ronson. Dayyan Jaffar, a 17-year-old archer from Singapore, was also part of the project. The only athlete who has yet to be recorded for the track is US 110m hurdler David Oliver. The athletes will be featured in advertising, interactive digital and mobile apps and broadcast content with Coca-Cola following their journey up to, during and after the London 2012 Olympic Games.